I am undoubtedly a cat person. Although I only own one, I have some close friends that own six, and going over to their house is always like a peek into some magical wonderland I wish I lived in. 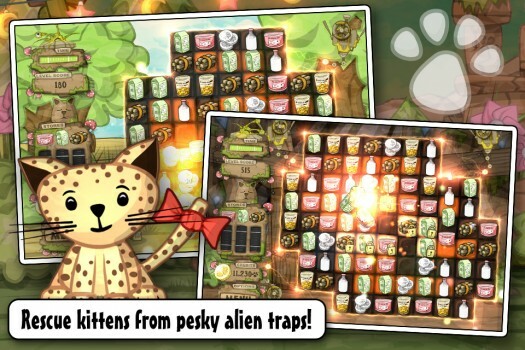 Suffice to say that any game featuring cats is bound to catch my eye, so when a colleague poked me and said, “There’s a new puzzler called Kitten Sanctuary [$1.99/Lite], and you need it! ", I figured I could be in for something good. At a peek, it looked like a cute match three puzzler, but after spending some time with the game, you get to see that while the game is simple, it’s really got quite a bit more to it than your average match three game. Rather than go with the bare bones approach that many iOS puzzlers seem to favor, developers Clockwork Pixels decided to go with a different type of experience, and I really like it. Of course, the heart of Kitten Sanctuary is still a match three. But imagine that cloaked in something like a Nintendogs lite, and you’ll start to get an idea of what to expect here. 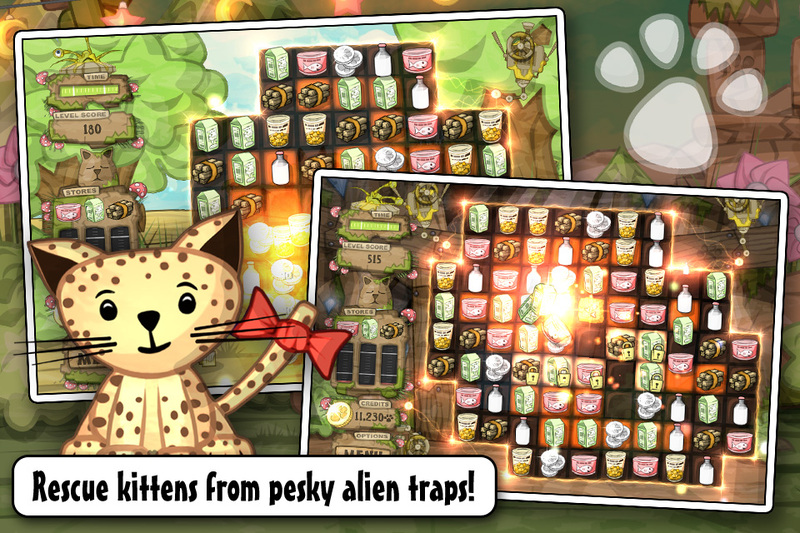 In story mode, Kitten Sanctuary brings you to “Kitten Island," where you must progress through a series of levels to rescue 50 kittens that have been kidnapped by aliens. In each level, you’ll play the match three game to accomplish this rescue. However, the items you match are actually resources, which you will amass on the left side of the board. The goal is to rescue each kitty by making matches over a set of red background tiles, clearing them in the process. Once you’ve cleared the entire pattern of red background tiles the level is cleared, and you can bring your furry friend back to the sanctuary. You’ll visit your secret kitten hideaway at the end of each level, and when you do, you’ll meet the cat you just rescued and learn something about him or her. This is where the game really shows off its charm. With not only a description of each cat’s background but a funny likes and dislikes list, you really feel like you are building a little family. The sanctuaries create some depth to the game, and can be a lot of fun to interact with. You can get toys to play with your cats to keep them happy, and you will often find as you complete puzzle levels that an event has happened in the sanctuary, like the cats have colds or need general cheering up. You can check their mood points at anytime by tapping each cat. If they seem down, you can play with them by buying toys from the shop to keep them stimulated. This would have been an ideal place to throw in IAP, but the game opts to let you earn money in-game instead by matching coins during the puzzle levels. I don’t mind paying for some in-game items from time to time, but I certainly appreciated it here that I didn’t have to spend any real world money to keep my cat family happy. In addition to toys, you can also earn enough money to add decor to the sanctuary if you have enough. Secret bonus gifts are also available for a higher price, should you want to do some saving. 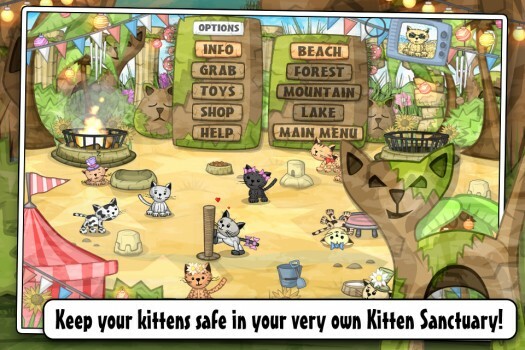 As far as modes go, you can adjust Kitten Sanctuary to be as easy or as hard as you like. In Easy mode, there is no timer and matching multiple tiles will win you powerups in the puzzle levels. In Normal, you are timed, and in Tricky mode, you have more red tiles than usual to match, but a longer time limit. If you don’t find enough to challenge you there, you can also aim to earn all seven trophies, some of which are very challenging. Kitten Sanctuary is a very sweet game, but beyond that it’s well-crafted, and the attention to detail shows. For $1.99, it’s simply packed with things to do and feels anything but bare bones, and there’s even a lite version to give you a taste of what you’re getting. It’s a breath of fresh air for a matching game, especially if you want something with a little more to it (but that is also fun to play). The only downside I can think of is if you don’t like cats. Luckily, there’s a dog version for PC, so you’re covered either way.